Candidates or TDs will often send a card with useful phone numbers (sometimes with a magnet so it can be stuck on the fridge), a guide to local services, Budget guides, guides to Benefits and so on all in the hope that you will hold on to them. World Cups and other sporting occasions also lead to a flurry of leaflets with fixture guides and the like. 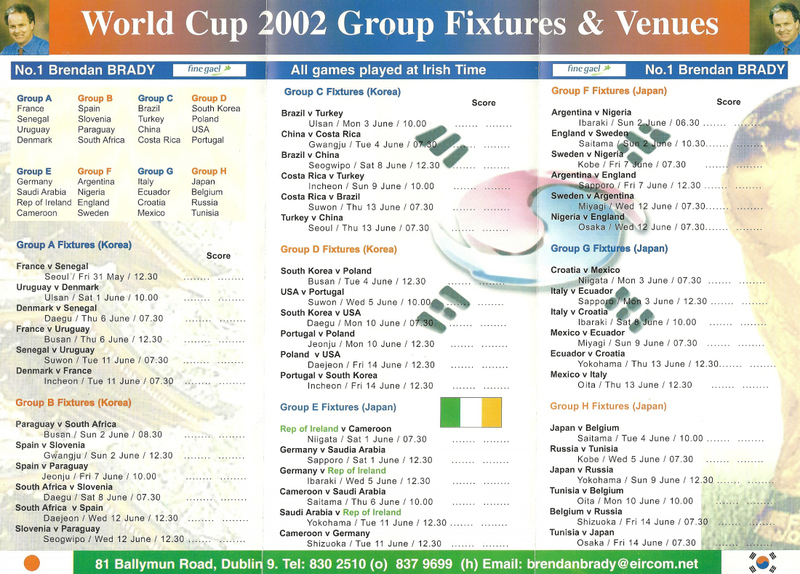 This one is a fixture guide for the 2002 World Cup produced by Fine Gael Dublin North west candidate Brendan Brady. The 2002 General Election was held on the 17th of May and Brady polled 2,082 votes and missed out on a seat.